Dr. Daniel Halasz grew up in Myrtle Beach, SC and attended Clemson University for his undergraduate education. 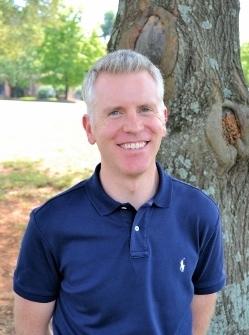 He obtained a Bachelor of Science degree in Biochemistry and fulfilled the requirements to achieve departmental honors from the Calhoun Honors College. After Clemson, Dr. Halasz enrolled in the Medical University of South Carolina College of Dental Medicine and graduated in 2004. He completed additional residency training at MUSC in the Advanced Education in General Dentistry program. After completing his dental education, Dr. Halasz moved to Mauldin, SC to practice general dentistry and joined the team at Mauldin Family Dentistry in 2012. He is an active member of the American Dental Association, South Carolina Dental Association and the Greenville County Dental Society. Dr. Halasz married his lovely wife Beth on Valentine's Day 2009, and they have a precious two-year-old daughter named Merin. Since his wife is also a Clemson graduate, they love to attend football games together on Saturdays in the fall. Dr. Halasz's other hobbies include spending time with his family, working on classic cars, playing guitar (poorly), and doing yard work. Richard H. Carpenter, Jr., D.M.D. Over 40 years of my life have been spent in two 1500 square foot buildings in Mauldin. Over that time, I have surrounded myself with people who chose me and like me, and I love them back. I wish I could be here to say farewell to each of you individually, but for many of you, this letter will have to do. As you know, three and half years ago, I made the decision to have Dr. Daniel Halasz take over my practice. I chose Dr. Halasz because I wanted to leave my patients, my practice and my employees in good hands. I knew then, as I do now, that I made the right decision. Since that time, I have served as an employee dentist at Mauldin Family Dentistry, LLC. I have thoroughly enjoyed these extra years in dentistry, but I have decided to retire from active practice effective June 30th, 2015. It is with great joy that I can leave the practice knowing that all of you who care about and who have supported me over the years will have an easy transition to the gentle, caring and extremely competent dentist I know Dr. Halasz to be. You will also have the same supporting part of the practice, which is our wonderful staff. Dr. Halasz, with Debbie's gentle assistance, will be the dentist I choose for my dental treatment. Cindy and Kris, with their excellent hygiene skills and beautiful personalities, will be my hygienists. I will look forward to having loving conversations with Laura and Cindy during my visits up front. I will miss seeing each of you, finding out what is going on in your lives, and enjoying your personalities. If I find some of those days with nothing on my agenda, you may see me up here, just getting a lift from hanging out with those of you who may be in the office that day. Thanks for the loyalty and friendships. God Bless you all. Richard H. Carpenter, Jr. D.M.D.